The PRO-CAST® Series is a full line of versatile Casting/Coating Machines for the production of high quality cast/coated products. Systems range in length from 12 feet, ideal for lab scale applications, to over 100 feet. The PRO-CAST® Series are “production proven”, having set performance standards in the production of millions of square inches of product. All are equipped with continuous conveyor systems with surfaces that assure imperfection-free castings/coatings. Production variables, such as conveyor speed, temperature profile, solvent gradient, and air flow, are adjusted and controlled precisely. 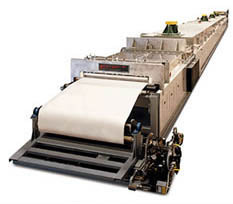 All models are equally adept at either continuous or batch operation. “Casting/coating thicknesses from 0.001″ to 0.125″ and widths from 4″ to 52” are routinely produced on a daily basis on PRO-CAST® machines. Large custom models are available to handle special requirements. A variety of casting/coating surfaces can be used, depending on the surface finish and release characteristics required. Casting can be done directly on a stainless steel belt or laid down on a coated paper or organic polymer carrier such as MYLAR® and ACLAR®.Coating can be unto foils or screen materials. Precise casting/coating surface ground and certified to a tolerance of+0.0003″. Sturdy structure with a solid level casting/coating platform. Constant speed microprocessor controlled digital drive with speed indication. Precisely set gaps for doctor blade or coating heads. Systems to consistently deliver slurry to the surface of the carrier. Forced, preheated air drawn in a counter-flow direction for convective drying, solvent gradient control, and exhaust removal. Exhaust system sized to be compatible with solvent or aqueous based slurries. Human Machine Interface (HMI) providing an easy to use operator interface specifically designed for the tape casting/coating process.